Speaking at the Pacific Northwest Consumer Electronic Expo, Dolby director tells dealers that an all in-ceiling Dolby Atmos system is ‘not the right experience,’ why 5.1.4 is better than 7.1.2, and offers up the five best demo Blu-rays. 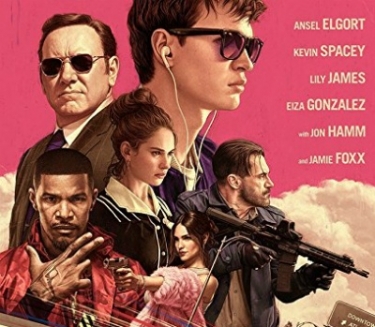 Check out the slideshow for eight great Blu-ray movie scenes to demo Dolby Atmos. Integrators are getting more clarification on exactly how to design and install Dolby Atmos speaker configurations for their customers. Speaking at the Pacific Northwest Consumer Electronic Expo (PNWCEE) this week in Seattle, Craig Eggers, director, content creation and playback, home theater, for Dolby Laboratories, pumped up a room full of dealers about how Dolby Atmos represents one of the first product opportunities in a long while for integrators to grow their business revenue volume and bring in new customers, calling the technology immersive, compatible, scalable and adaptable. To date, there are 67 Blu-ray titles in Atmos with the total due to reach 100 by the end of the year. Mixing Legacy Equipment: Do not be afraid to mix legacy equipment with Dolby Atmos, says Eggers. Using the newly renamed Dolby Surround Upmixer, integrators can make non-Atmos channel-based content sound pretty darn close to real object-based surround sound. The upmixer is included in every Dolby Atmos Hardware Bundle. For in-wall listener-level speakers, Eggers recommends they are at least 3 feet below the ceiling. The speakers should be placed outside the perimeter of the seating area and in line with the left and right mains. They should be facing downward for rooms with high ceilings. For rooms with lower ceilings, toe-in the speakers. Tweeters should be aimed at the primary listening position. The seated positions should be at minimum 3 to 5 feet from the speaker; this is especially important for the rear speaker placement. 5.1.4 Better Than 7.1.2: Dealers should opt to design a 5.1.4 system configuration (five listener-level speakers, one subwoofer, and four overhead speakers) over a 7.1.2 design for the best object imaging and panning. “You need to have four Atmos speakers overhead to move the sound around. With just two Atmos speakers, you are just moving sound back and forth,” he adds. Speaker Type: Full range or bass-managed speakers are best for the Atmos speakers. They should be timbre- and power-matched to the primary speakers. Speakers should always be calibrated using room EQ. Eggers suggests dealers run the Auto EQ to match with forward-firing speakers in case there are ceiling losses. Use Wide Dispersion Speakers: Eggers says wide dispersion patterns (+/- 45 degrees from 100Hz to 10KHz) are ideal, especially in a room with 8- to 14-foot tall ceilings. Officially, Dolby does not recommend any particular type of speaker for Atmos: bipolar, dipolar or tripolar. 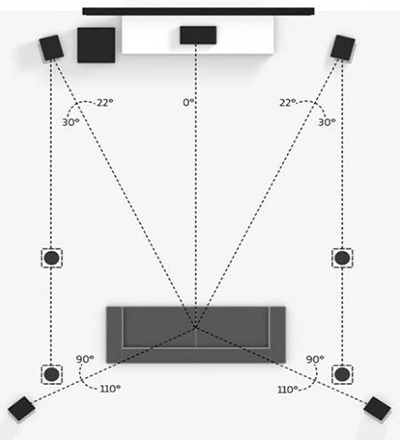 Dolby advises using a 5.1.4 speaker configuration (pictured here) vs. a 7.1.2 array, saying it is more important to have four overhead speakers instead of the extra rear speakers. As for the PNWCEE, the one-day event, which is put on jointly by local Northwest manufacturers’ reps and distributors, drew 750 registrants to meet with 155 different 12V audio and home electronics vendors and 40 educational seminars at the Doubletree at SeaTac Hotel. About half of the vendors and attendees were car/marine audio companies. Another well-attended session was a deep dive into 4K by noted industry expert Michael Heiss. He was adamant with integrators that they should not disregard 4K as a gimmick like 3D. “4K is not more pixels, it is better pixels and faster pixels,” he noted. Heiss says the increased number of pixels will bring better resolution (four times 1080p), while the “better” pixels mean Wide Color Gamut, improved color sampling, High Dynamic Range and deeper bit rate. Moreover, “faster” pixels mean a higher frame rate. Using the Lechner Distance Scale, Heiss says the ideal screen-to-couch viewing distance is 7 feet, 9 inches away. He notes that the TV screen needs to be at least 55- to 70-inches diagonal for the viewer to see a discernable difference between 4K and 1080p. That size TV is right in the wheelhouse of most integrators. Check out the slideshow to see some excellent demo options for Dolby Atmos! Steve—Thanks for catching that. I went back to my notes and you are correct that Craig said do not use dipolar speakers. Officially, Dolby does not recommend any particular type of speaker for Atmos: bipolar, dipolar or tripolar. I have made that correction. “He also says dipole speakers are best” must be a typo or mistake. Triad Speakers has been Dolby Labs development partner for home Atmos speakers for about 3-1/2 years, I can’t count the number of times I’ve heard Craig say, Do NOT use Dipoles.” Dipoles’ out of phase elements are designed to diffuse sound; they are inherently incapable of the imaging precision necessary to support sound object imaging, which is the foundation of Dolby Atmos. Bipoles on the other hand can be very effective for Atmos and can minimise the dominance that disrupts the listening experience of listeners seated near surround speakers. And shame on Dolby for saying an all in-ceiling system won’t work. GoldenEar demoed just such a system at last year’s CEDIA exhibit and received rave reviews from visitors and the press. And I have yet to see or hear any demonstration of up-firing speakers that even remotely equaled the experience of in-ceiling height channel speakers. I think Dolby is way to concerned about collecting Atmos-enabled royalties than really telling it like it is. Don’t be fooled by their self-serving “best practices”. Lost me at “Run the auto EQ”....That whole thing needs to go. Never repeats the same results twice, easily fooled by room anomalies, and I have yet to have a client say “wow that auto calibration mad my system sound great!”. Pay a professional to calibrate your system properly. Shame on Dolby for promoting this as a best practice.